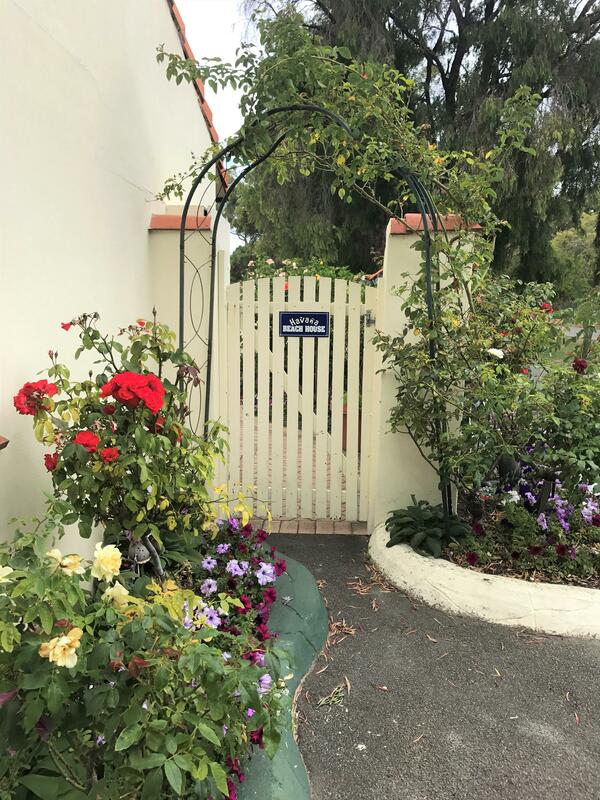 ALBANY'S FAVOURITE BEACH SIDE CHALETS... Metres from the sea, our 2 bedroom, self-contained chalets in gardens away from traffic, are equipped with everything you need for your holiday at Emu Point. 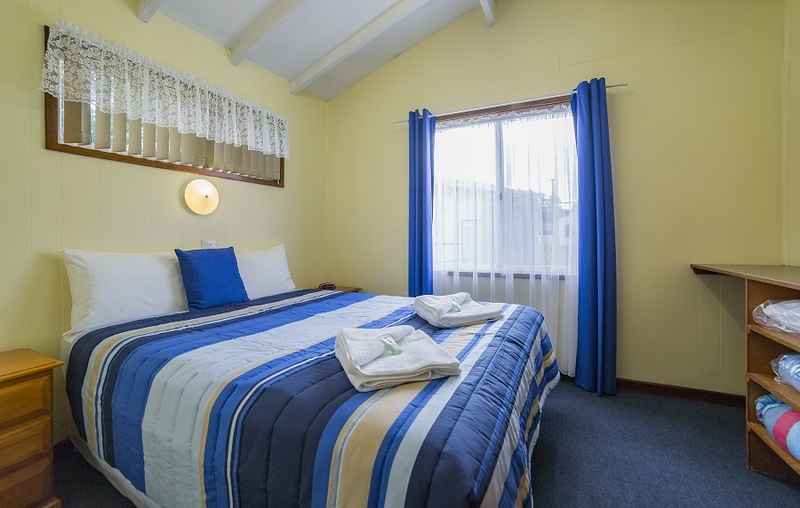 Each chalet has a master bedroom with a double bed, a fully equipped kitchen with sitting area, ensuite bathroom and toilet and a second bedroom with sets of bunk beds. Some chalets providing accommodation for up to 9 people. Reverse cycle air conditioning!! Parking right at your door, lush green lawns, gas BBQs, bike hire, a nearby playground and tennis courts. Beyond these are the inviting beaches of Emu Point and Middleton Bay, the wonderful wild scenery of the Southern Ocean, wineries and food of the Great Southern Region. Albany is only an 8-minute drive away. Enquire now for your next visit to Albany. (Linen is included in the tariff) 2 bedroom self contained chalets only 80 metres from beach. All our chalets have there own ensuites. with 1 x double bed in the main bedroom and 2 sets of bunk beds in the second bedroom. 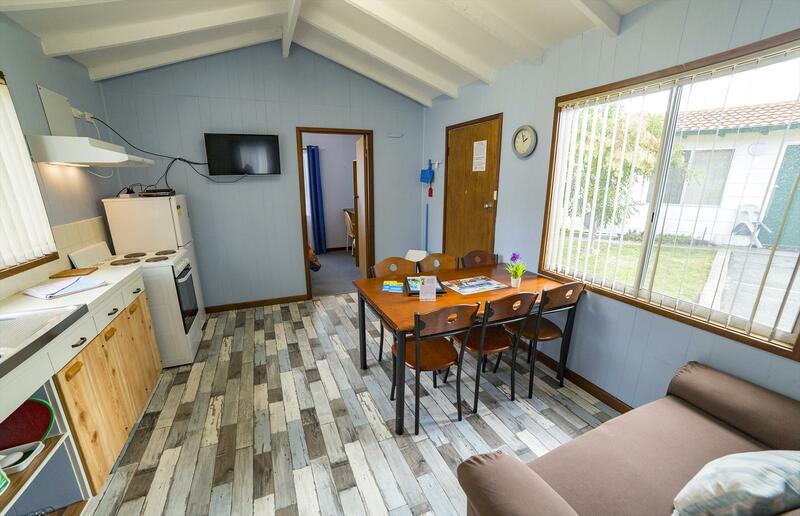 Our 2-bedroom chalets feature a central kitchen/living area with all cooking utensils and a flat-screen TV/DVD player as well as FREE WIFI and reverse cycle air-conditioning. Children under 2 years old are free. Cots and highchairs available on request. A foldabed or trundle is available for an extra person with an extra fee of $25 per night. � Queen Chalet� sleeps 6. Chalet details: Our comfortable 2-bedroom Queen chalets have 2-bedrooms. Bedding configuration: Bedroom 1): 1 x queen bed. Bedroom 2): 2 x sets of single bunk beds. Offering crisp white sheets, pillows, cosy doonas and warm woollen blankets to ensure your comfort. Bathroom contains a shower, toilet and vanity basin, fluffy white towels, hand towel, face washer and large bathmat are supplied along with a starter pack of soaps. Hair Dryers are also supplied. A roomy central kitchen/living area is well equipped with all you need. Extra-large cooking pots and Rice Cookers are included. A starter pack of tea, coffee, sugar, sweetener, salt and pepper means you can relax with a cuppa when you arrive. Covered BBQ areas, with FREE gas barbecues are available throughout for your convenience Also a large semi enclosed BBQ area with sink, hot and cold water and extra plates suitable for group gatherings. Our 4-Bedroom beach house offers 2 bathrooms with an enclosed yard and large outdoor patio including BBQ, outdoor setting and TV. spacious fully equipped kitchen with 2 full sized fridge/freezers, toasters, microwave, crockery, cutlery and cookware provided. All linen/towels included. 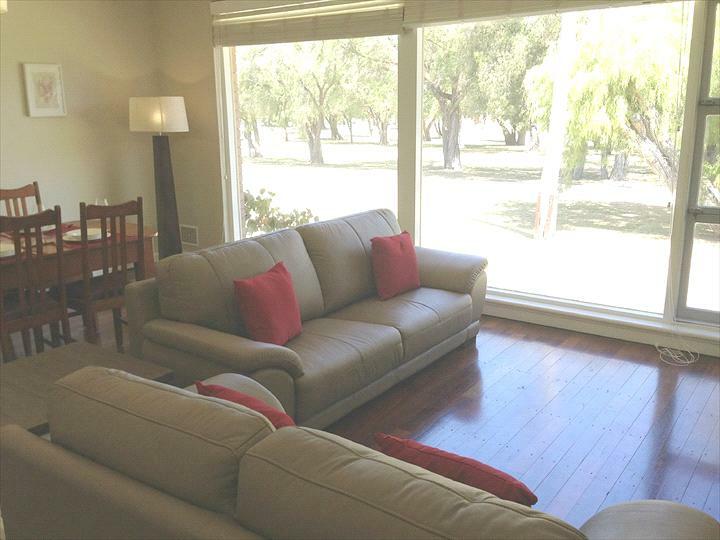 Large flat screen TV and DVD player in the lounge room. own laundry with washing machine and dryer. Undercover clothesline and even a rainwater tank. Cots, highchairs and nursery linen available on request at no extra charge (children under 2 years old are FREE) Bedding configuration: Bedroom 1): 1 x queen bed. Bedroom 2): 2 x single beds. Bedroom 3): 1 x single bed & 1 x set of single bunks. Bedroom 4): 1 x double bed & 1 x single bed. 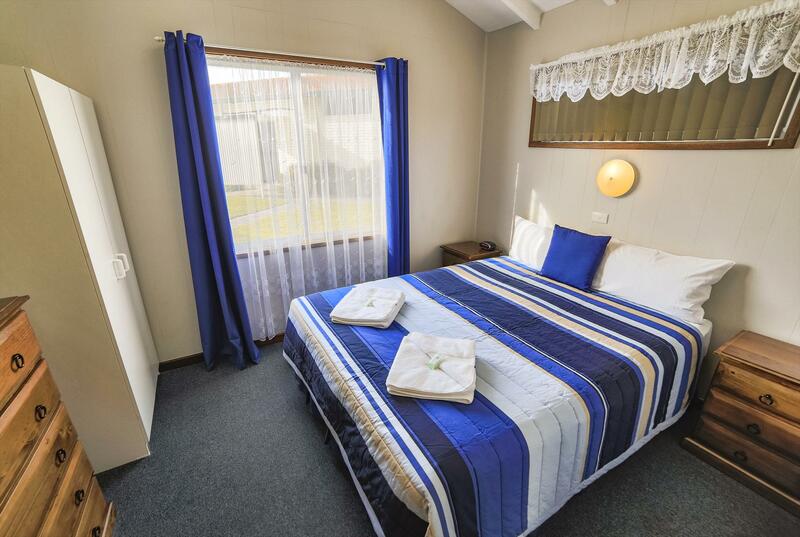 Our 2-bedroom double chalet is self contained and sleeps 7 max occupancy. Price is for 4 people with each extra person $25 per person per night. Featuring a central kitchen/living area fully equipped with cutlery, crockery & cooking utensils, as well as a flat-screen TV/DVD player, FREE WIFI and reverse cycle air-conditioning Bedding configuration: Bedroom 1): 1 x double bed. Bedroom 2): 1 x double with overhead single & 1 set of single bunks. (Children under 2 are free with cots and high chairs available on request). Our 2 bedroom group chalets sleep 9 to10 people (Great for large families). Price is for 4 people. 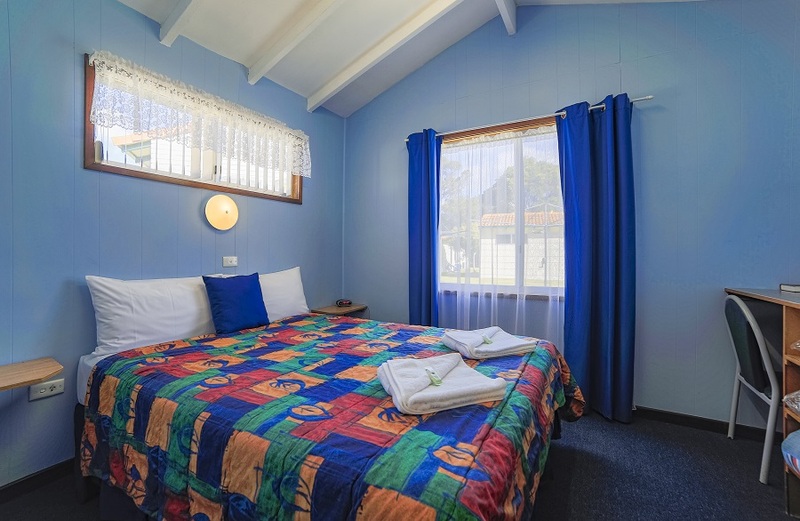 Extra person is $25 per person per night Fully self-contained with a central kitchen/living area including cutlery, crockery & cookware, a flat-screen TV/DVD player, FREE WIFI and reverse cycle air-conditioning. Bedding configuration: Bedroom 1): 1 x double bed. Bedroom 2): 1 x double with overhead single & 2 x sets of single bunk beds. Children under 2 are free with cots and high chairs available on request. 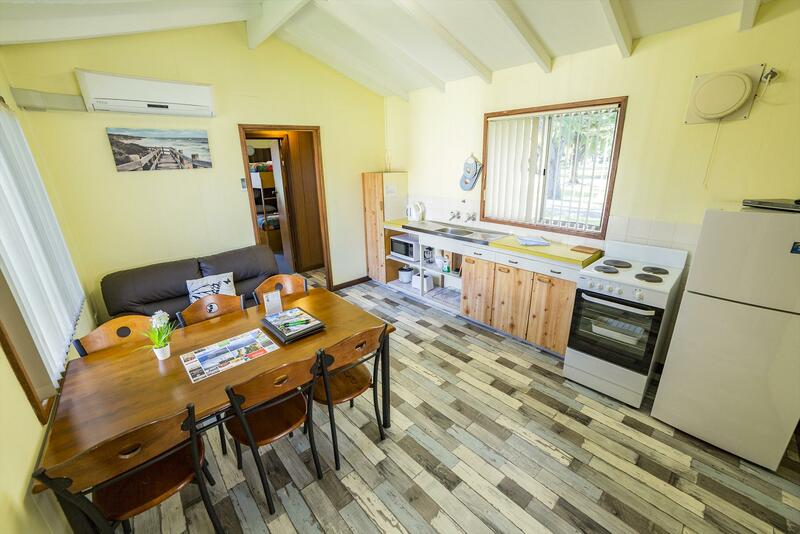 Our 2 bedroom group single chalet is self-contained and sleeps 8 max occupancy. Featuring a central kitchen/living area with cutlery, crockery and cookware. As well as a flat-screen TV/DVD player, FREE WIFI and reverse cycle air-conditioning. Bedding configuration: Bedroom 1): 1 x double bed. Bedroom 2): 3 x sets of single bunk beds. Children under 2 are free with cots and highchairs available on request. Price is for 4 people with $25 per extra person per night. (Linen is included in the tariff) Our Ocean View chalets are self-contained with 2 bedrooms. Max occupancy of 6 guests. Located only 80 metres from Emu Beach. 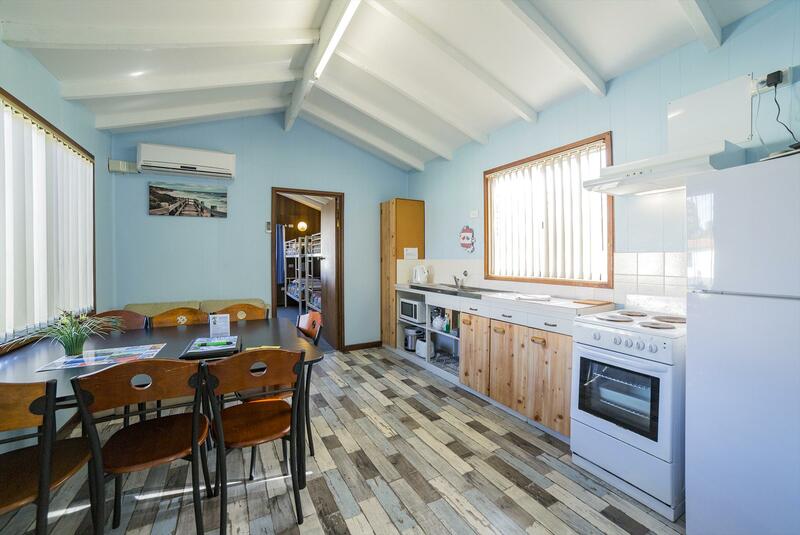 Featuring a central kitchen/living area fully equipped with cutlery, crockery & cookware as well as a flat-screen TV/DVD player, FREE WIFI and reverse cycle air-conditioning. Bedding configuration: Bedroom 1): 1 x double bed. Bedroom 2): 2 x sets of single bunk beds. Children under 2 years old are free. Cots and highchairs available on request. There will be a $62 Albany visitors Centre cancellation fee.